In Life, it's not where you go, but who you travel with. Family, Friends - those who mean the very most - are at times the hardest to get together. It's time - clear your calendar, grab those you love, and head to fabulous Chincoteague Island. If you make the time, we've got the place! Welcome to stately Great White - the perfect place to gather, reconnect, and relax. This gorgeous Historic Home is located on Main Street, only steps from Downtown Shops, Dining, and Robert Reed Waterfront Park - home of the best Sunsets to be found & Family-Friendly Free Events all Summer long! Besides the fact the Great White is an expansive Home that sleeps 12 and combines all you love about yesteryear with Modern Amenities, it also welcomes your Family Dog AND has Pool Access right next door at Sunset Bay Villas! Just imagine lounging at the Bayfront Pool after a fun-filled day at the Beach! Not to mention, Great White wraps this all in a very affordable package! If you're looking for shiny and new, Great White may not be the right place for you - but if you appreciate the quintessential Chincoteague Charm and History that this amazing Home has to offer, you're going to fall madly in love. Built in 1925, this statuesque dream home has grown over the years, as the family that loved her grew. With ample space to be together, but not crowded, she sleeps 12 in 5 Bedrooms plus Den. As you pull into the long driveway, the Wraparound Front Screened Porch beckons you - a fabulous place to meet at the day's end to share stories of your adventures. Furnished with Antique Wicker and plenty of seating for all, you'll never want to leave. There is plenty of parking behind the house - even room for your boat trailer and other water toys. 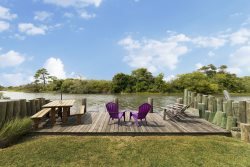 Fido will love the Fenced-in Side Yard, and you'll love the glimpses of the Chincoteague Bay as you grill the Fresh Catch of the Day. Wandering in through the Mudroom, perfect for storing your Beach Gear, you can kick off your Flip Flops and let the fun begin. On the 1st Floor, Great White has so many places to gather. The Eat-in Kitchen is well-stocked with all you need for family mealtime. Grab a quick bite bite at the Kitchen Dinette before exploring our beautiful Island, or sip your coffee on that wonderful Front Porch. The expansive Dining Room has plenty of room for the whole gang, as well. Not one to cook on Vacation? You're only steps from some of our favorite restaurants, including Bill's Prime Steak & Seafood, The Ropewalk, and Don's Seafood. Cool off in the Living Area and enjoy the Satellite TV and Free WiFi, or curl up with a good book in the Sitting Area. The 1st Floor Master is beautifully decorated with touches of a bygone era, and perfect for those not wanting to deal with a lot of stairs. The Master Bath has a Tub/Shower Combo, gorgeous Custom Blue Tilework, and a fabulous Historic Stained Glass Window - just stunning. Also on the 1st Floor is a spacious Utility Room with a 2nd Refrigerator, Full Size Washer & Dryer, and a convenient Half Bath. Upstairs you'll find 4 more Bedrooms plus a Den. Bedroom 2 has a Queen Bed and colors of Sea Glass - blues and yellows. With all new Bedding, it will feel incredible to sink into at the end of the day. Bedroom 3 has 1 Twin and 1 Full and Beachy Blue Walls, and Bedroom 4 has a Tropical Theme with Twin Bunk Beds. Patriotic Bedroom 5 has a Twin Bed with Twin Trundle. There is also a Den/Sleeping Room that has an additional TV, Full Futon, and Twin Futon - the kids will love this room! Looking for yet another spot for a little "you" time? There is another Sitting Room upstairs with a comfy Wicker Loveseat and access to a small Balcony offering some water and causeway Views. The upstairs Master Bath is truly unique with a classis Claw Foot Bath Tub! There is also a Glass Walk-in Shower and ample space. With all of this PLUS access to Sunset Bay's Bayfront Outdoor Pool, what more could you want? Relax poolside and take in those salty, sweet bay breezes. Chincoteague is a great biking town - bring your own or rent some right down the street. Or, try your hand at crabbing in the Marsh between Sunset Bay and Great White - so much to do, you just may need to stay awhile!